Warren Feeney's first game as Newport County boss saw them beat bottom side York City through Aaron Collins' goal. Feeney, appointed on Friday following John Sheridan's departure to Oldham, saw Collins find the net with a low drive into the bottom corner. York stepped up the pressure on Newport with Dave Winfield and Vadaine Oliver going close for the home side. Debutant keeper Mitchell Beeney denied Oliver as Newport held out for their first win in five games. County are six points clear of the League Two relegation zone while York remain bottom, three points off safety. "I thought we started very slowly. We were on the back foot and it was very poor how we started the game. "I thought after that we got into it and started moving the ball and we caused them some problems. "But I'm disappointed, I think it was a game we shouldn't be losing. That's six points I feel we've wasted. "We have to take our opportunities when we get them." Newport County manager Warren Feeney told BBC Radio Wales: "It was such a massive game but I had every confidence in the players. "I would have taken a draw before the game, as long as we didn't get beaten. "I thought the boys showed desire and determination and it was a great result. The boys fully deserved that." Match ends, York City 0, Newport County 1. 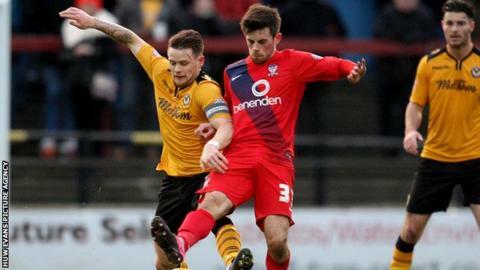 Second Half ends, York City 0, Newport County 1. Foul by Ben Davies (Newport County). Substitution, Newport County. Matt Taylor replaces Scott Boden. Attempt blocked. Dave Winfield (York City) right footed shot from outside the box is blocked. Corner, York City. Conceded by Yan Klukowski. Bradley Fewster (York City) wins a free kick in the attacking half. Substitution, York City. Bradley Fewster replaces Kenneth McEvoy. Attempt saved. Medy Elito (Newport County) left footed shot from outside the box is saved in the centre of the goal. Attempt saved. Scott Barrow (Newport County) right footed shot from the left side of the box is saved in the bottom left corner. Corner, Newport County. Conceded by Femi Ilesanmi. Substitution, Newport County. Scott Barrow replaces Connor Dymond. Foul by Kenneth McEvoy (York City). Ben Davies (Newport County) wins a free kick in the defensive half. Corner, York City. Conceded by Ben Davies. Substitution, York City. Michael Coulson replaces Luke Summerfield. Attempt missed. Connor Dymond (Newport County) right footed shot from the centre of the box misses to the left. Substitution, York City. Ntumba Massanka replaces Daniel Galbraith. Kyle Cameron (York City) wins a free kick in the attacking half. Corner, York City. Conceded by Mitchell Beeney.